One of the highest output A-Shape LED replacement bulbs on the market today is the Philips AmbientLED A19 12.5W, which replaces a 60W incandescent with 800 lumens of soft white 2700K light. This LED bulb is the first 60-watt equivalent LED replacement bulb, and is omnidirectional, fully dimmable, and has a rated life of 25,000 hours with a 6-year warranty. 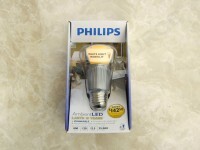 MSRP for the Philips AmbientLED A19 12.5W LED bulb is $39.97, and the bulb can be found online, or in your local home improvement store. 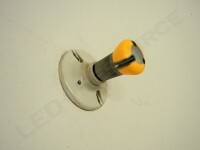 The bulb consists of an opaque orange plastic top and large metallic heat sink that dissipate heat from the circuitry and LED. 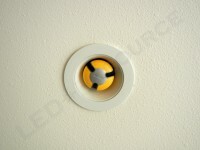 Light is projected evenly both upwards and downwards from the LED bulb. 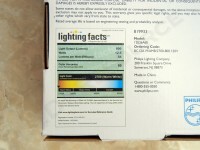 The AmbientLED bulb can be dimmed, so we tested it in a Lutron dimmable ceiling fixture. On the lowest setting, the incandescent bulbs were barely lit, while the LED bulb was much brighter. During our testing, two of the seven incandescent bulbs on that circuit burned out, one following the other. 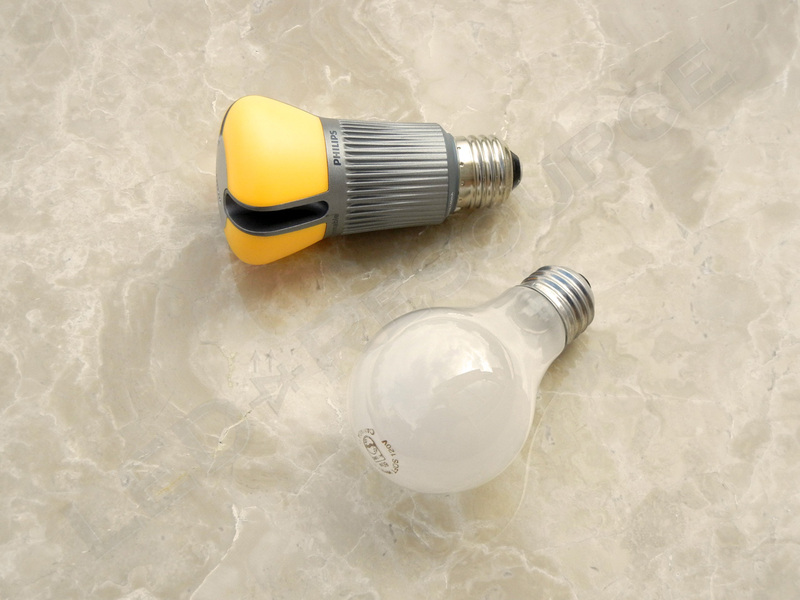 This could be more than just a coincidence, so we advise against mixing LED and incandescent bulbs. We tested the AmbientLED bulb against 45W and 60W incandescent bulbs, and found it to match the brightness of a 60W bulb without issue. The AmbientLED does have a split second power-on delay. Light distribution rivals that of an incandescent, making it ideal for use where more directional LED bulbs fall short. 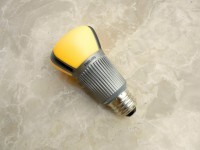 The color temperature of the LED bulb is very similar to incandescent bulbs due to the orange filter. 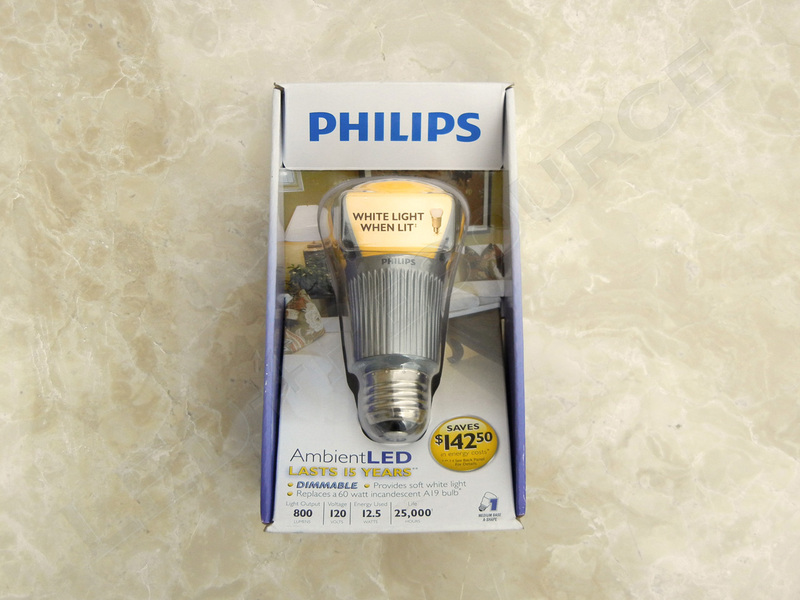 The Philips AmbientLED A19 12.5W is a true 60W-equivalent LED replacement bulb with uniform light output and is also dimmable. 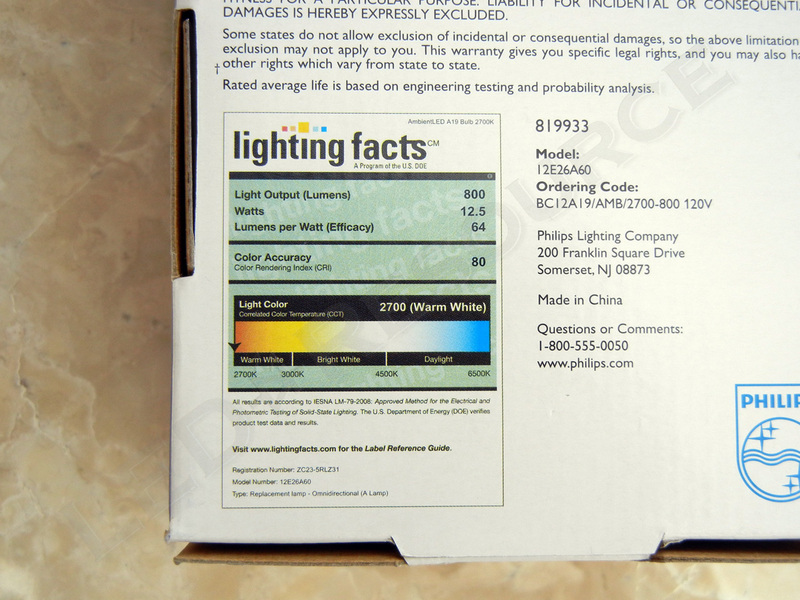 In order to achieve the warm soft white color, Philips used an orange filter, which can be unsightly if installed in an open fixture. 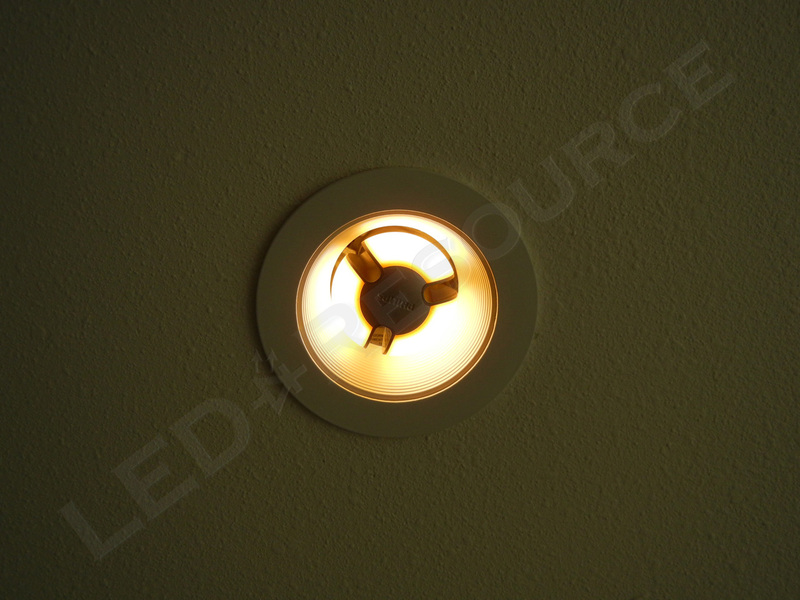 However, if the bulb is hidden or the color doesn’t bother you, the AmbientLED 12.5W LED replacement bulb is a great choice where the typical 40W-equivalent LED bulb isn’t bright enough. High-output 60W-equivalent LED replacement bulb with soft white omnidirectional light. There is *no* chance that the presence of the LED bulb had any relation to the incandescent lamps burning out and absolutely no reason not to mix them on a circuit. 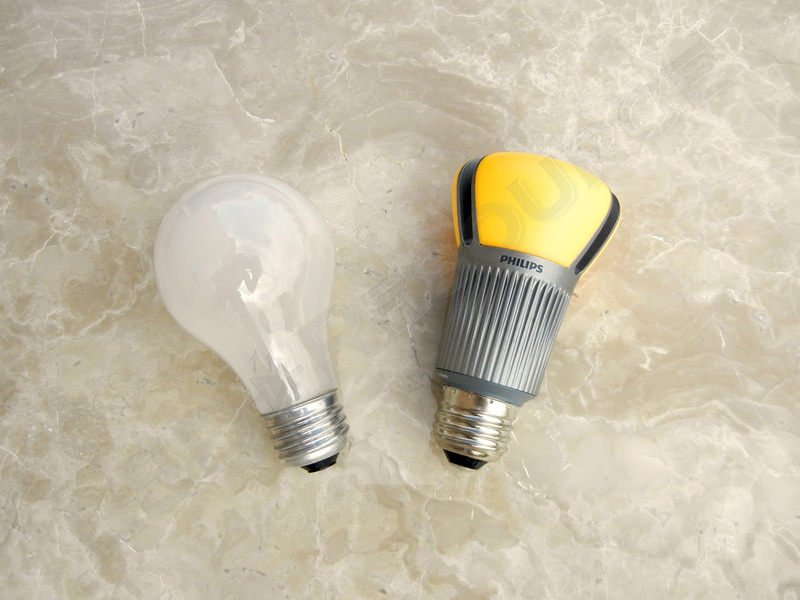 Simple fact is that incandescent bulbs just don’t last all that long and bulbs installed at the same time will often fail within days of one another. I had that happen lots of times back long before LEDs were useful for general illumination. 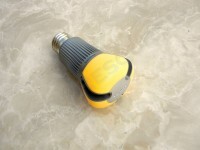 The usual cause for excessively short incandescent lifespan is vibration or just low quality bulbs. I just found these on sale for these at 15$ each and love them. It may seem like a high price but when I do the math for what I spend on incandescent bulbs, the units pay for themselves in a little over a year and then the saving continue with the lower usage cost and an estimated decade or two of life. 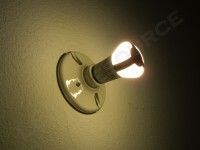 The big issue for me with CFLs is the quality of the light. It just bugs me and there is no way I could have them in my home. Throw in the mercury, fragility, shortened lifespan when turned on and off often, poor dimming ability and there are way too many duds and the CFLs are not even a consideration. Heck, some CFLs these days don’t even last a year and the AmbientLED has a six year warranty (find a lamp with a warranty like that!) and is rated to last over twenty years with 3 hours of use per day. 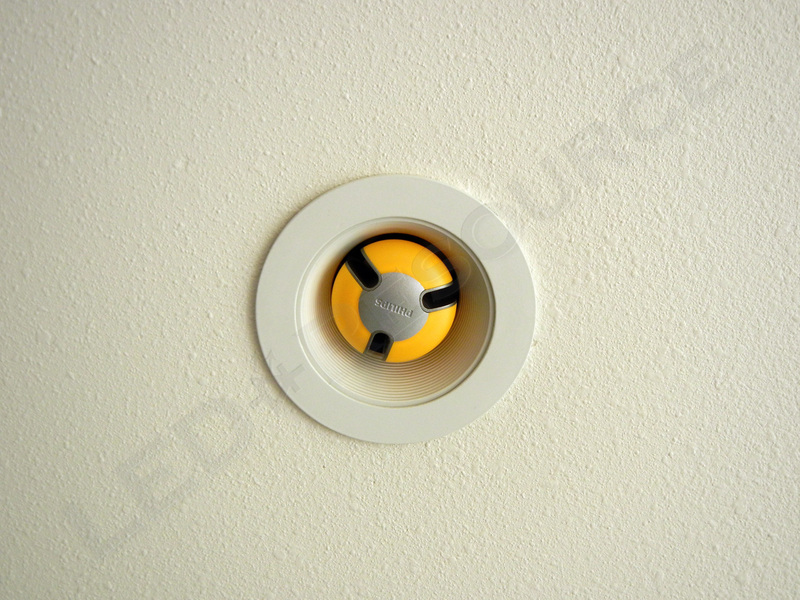 Also the AmbientLED doesn’t contain lead or emit any UV (i.e. won’t fade stuff). All the advantages increase the value of this product so much that it is a far better deal on many counts and they just released 75W equivalent bulbs and have a 100w (the Holy Grail of LED incandescent replacements. I have no interest in environmentalism but the deal this product represents, if you can find it around 15$ like I did (and they are only going to get cheaper as they get more popular), is a great way to save money in the long run without sacrificing quality. these lights look exactly like incandescent. I did A/B with my some friends and they couldn’t tell the difference. I bought a 75w too and they are nice but too expensive. we may all move back to 75 and have a nice bright house!